← Good Food – Is it important? We are happy to say that we are now taking CSA memberships for the 2015 CSA season! Click here to join! Our CSA season is 23 weeks long from May 18 to October 22. In the past our CSA has been 22 weeks, so we’re excited to add an additional week! New in 2015! Our Friends of Red Wagon share is for people who want to go above and beyond in supporting our farm. Let’s face it, there are so many things stacked against small farms. Do you truly value Red Wagon produce and the benefits Red Wagon brings to our community? Are you in a strong financial position? Then the Friends of Red Wagon Share is for you! You will be helping to ensure the long-term viability of Red Wagon. –You will be allowed to take up to $40 in produce each pickup. –You will have additional access to our farm and there will be additional farm events for you. This is your way to give additional financial support to our farm. You will not receive the full dollar amount in vegetables. Friends of Red Wagon is a new program for us. We would like to hear from you as to what benefits you would like and what you would value. Please contact us directly if you would like to discuss this program more. Send an email to Wyatt@RedWagonOrganicFarm.com. At Red Wagon we recognize that our farm workers are one of our biggest assets. They are the ones who grow your food and harvest it for you each week. Without our farm workers we would not be able to bring you our amazing produce. We start our farm workers at $10/hour, which is high for farm worker pay. But realistically, this is not enough for the work they do. It is not easy being a farm worker. The work is incredibly hard, the hours are long, there is no reliable source of income in the off-season, and the list goes on and on. We try to pay our farm workers as much as we can, but the economics of food and small farms currently do not allow us to pay more. We have had a lot of incredible farm workers over the years, but we have not been able to keep most of them at Red Wagon for more than a season or two. Most people cannot afford to live on a farm worker income. We are asking our community to help us invest in our farm workers to give Red Wagon more long-term stability. As an example, a contribution of $10/week would increase the pay of one farm worker $230 total over the course of the CSA season. Any amount you can contribute is greatly appreciated. The money you contribute will go directly into farm worker paychecks. We want to be transparent and accountable in our endeavor to financially support our farm workers. Please contact us if you would like to be on a committee to help monitor our Farm Worker Support program. 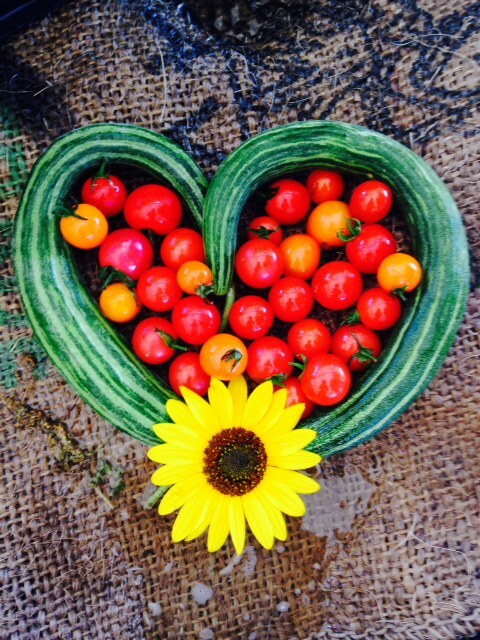 For all the details on our 2015 CSA please see our website. We hope you will join us for a delicious season! This entry was posted in 2015, Farm. Bookmark the permalink.